I’m from Shreveport, Louisiana. I was born there and raised in Belcher, Louisiana, which is on the outskirts of Shreveport, so I am a country girl. My family is music; my dad and his brothers played gospel and they would probably have done some other types of music, but in that era you didn’t go to your mother and tell her that you were going to sing anything other than gospel. My dad wanted to branch out and do other things but gospel was his love, so that’s where I got music from, was my dad. My whole family, like my sister and brother are into music. My sister sings background for me and arranges most of my background on my CDs, and my brother he sings also. He has started singing with us before that he was gone most of the time in the military. He has retired from the military now, so he can get involved with music now. My niece is one of my background singers and my other brother Luster Baker, he is the musical genius in our family. He arranges all of my music, he is a vocalist and plays the keyboards and he is releasing his debut CD as we speak, it’s southern soul and blues. He has been in the rap industry and has done tracks for famous rap artists. I can’t exactly pinpoint when I started singing because I’ve been singing all my life, but I would say I started about four years old, probably. I’m the oldest in my family so when I babysat for the family, we used to sing and play instruments. I’m a band director, that’s what I went to school to do. I have a masters degree in music and I am a band director. I teach instrumental music like the flute, the clarinet, the alto saxophone, trumpet, baritone horn. I do the marching band. You see them on the field in the football games. I do the concert band in high school and I’m also the vocal teacher at the high school currently. Twenty seven years I’ve been a teacher. I’ve been singing all my life, started in the church from an early age at New Bethel Baptist Church in Belcher, Louisiana. Then in school about fourth grade I got in the band, and that’s when I started my band part of music, then at high school, and the band paid for college. I was playing instruments in the high school band, I was playing baritone horn and I got a scholarship when I finished high school to Mississippi Valley State University at Itta Bena and from there I got a scholarship to the University Of Mississippi to study instrumental music. From there I began teaching in 1986. I have always had my own little group such as Champagne Plus 2, I was in a group named Jade we were all vocalists and I was in another group named Rhythm Warehouse, I was the lead singer. These bands were playing southern soul, r&b and a little bit of everything and we played at casinos, parties and stuff like that. Then I met some of my friends in Vicksburg, a guy with The Project Band and he encouraged me to get into my own thing as I was doing background vocals for people like Ernie Johnson and then Willie Clayton, I was on the road with him for about five years, and then when I left Willie in 1997 that is when I went out on my own and I recorded my first CD ‘Don’t Gimme No Lip’. I decided that with the help of my manager at the time, Stephen Hall, I decided that I needed a single. I’m trying to make my debut as a solo artist so I needed a single. Actually ‘Don’t Gimme No Lip’ was written by a young man named Ben Shaw, and I met him through one of my students. He was an uncle to one of my students at the time and he told me that he had a song for me and that’s how I got ‘Don’t Gimme No Lip’. When I decided to record it I shopped record labels and tried to get a bite, but no bite. I had recorded that song and the flip side to it ‘We Almost Had A Good Thang’, just those two. So I got them printed up and I thought I would work the industry with them and that’s what we did. We started going to all the radio stations, getting d j’s to play it, and going to all the clubs and getting them to play it. I did that for about two or three months and I was getting airplay and was getting a little buzz and that’ when I got a call from Stan Lewis. He said he wanted to sign me and that I would be given the creative ability to do a CD. I’ve always wanted that and it’s very important for me to be part of it, and I want my music to be an indication of me and the person I am. So I wanted to choose my musicians and where I wanted to record the CD and stuff like that and Stan gave me the freedom to that. As you know, Paula/ Jewel is from Shreveport where I am from. However I recorded the CD in Jackson, Mississippi and I found the studio through Harrison Calloway. He did my music and arranged the full CD. When Paula signed me they used those two numbers, ‘Don’t Gimme No Lip’ and ‘We Almost Had a Good Thang’ and then we did other songs to make a full CD. So I went back in the studio in Jackson with Harrison Calloway and we did the whole CD. I had used Harrison to do those two singles that I had done. I used various guys to write numbers on that CD, which we called ‘Don’t Gimme No Lip’. There is a guy in Vicksburg called Fred Hall, I met him through one of my friends. He is a police officer and he has a little studio, Expression Studios in town and he is a writer, so he wrote three songs on that CD ‘She’s A Lady Of Love’, ‘Price For Real Love’ and ‘Why My Baby Left’. That’s what I mean about me having the freedom to do what I want to do. Remember now I play horns and instruments so I said I wanted horns on that CD. I wanted the sound like Denise LaSalle at Malaco and Bobby Bland with those big horn sections, so that’s what I did with that ‘Don’t Gimme Me No Lip’ CD. After ‘Don’t Gimme No Lip’ I started putting a band together, as I was starting to go out on the road and do those songs live because they were getting a good buzz. My brother Luster was my band director and my sister sang background for me and one of my former students Nikita Chambers also sang background vocals and we are still together up to today. I’m now doing my fourth annual Vickie Baker North Caddo Homecoming blues festival this year in Vivian, Louisiana. So I put the band together and we are still on the road. Three years later, after ‘Don’t Gimme No Lip’, comes my next CD called ‘Good Loving’. After the ‘Don’t Gimme No Lip’ release, Paula Records sold out to an internet company and they had a huge catalogue of music, so I then have mixed emotions and I was always told by my dad that anything you have that belongs to yourself is better than something that somebody else can issue you with. So I was upset about the Paula thing as I had all that good music and I didn’t have any control over it. It didn’t belong to me anymore, it’s like your baby has gone. So I thought what am I going to do now? So I started my own record company, So Fly Records and it was myself and my manager Stephen Hall that developed the label. My next two CDs ‘Good Loving’ and ‘Love Strike’, they were both on So Fly Records. We had our own studio and we hired the musicians ourselves. They were recorded in Vicksburg, Mississippi in our studio. Rue Davis has written for me and we collaborated on the ‘Love Strike’ CD. Frank O Johnson he wrote ‘We Almost Had A Good Thang’ on that ‘Don’t Gimme No Lip’ CD. I met Frank O through Harrison Calloway, as they were good friends. The ‘Good Loving’ CD had some good songs on it. I wrote ‘One Good Man Too Late’ on the CD and I wrote it on the way home from school one evening. I was watching the Golden Girls on TV and one of the ladies, she had guys fighting over her and she had chosen who she wanted to be with and a guy came up to her and told her he loved her and he wanted to take her out for dinner and she looked at him and told him he was one good man too late. So I thought that was a good line for a song and I wrote it from there. In the blues, the ladies always sing about the men being no good but not all men are like that. There’s another song on there called ‘Southern Stroll’ and there is a dance step to it and I sing about stuff from the south like fishing, cornbread, greens, barbecues, southern hospitality and all that kind of stuff. On the CD ‘Love Strike’, which was out in 2003, I have a duet with Bobby Rush and it’s called ‘Don’t Leave Your Wife’ and I wrote the song and Bobby collaborated on it. There was about a three year gap between each of those CDs being released. Through all of this I’m still doing live music and entertaining with my own band. I’m at the Chicago Blues festival this year. I completed my last CD which is ‘I Could Show You’ in 2007 and that was the last thing I did. I am currently in the studio as we speak, cutting some more tracks. I’m not on my own label now. Now I’m doing semi my own and semi investor. One of my friends Mike Gardner from Shreveport, we collaborated and he engineered the last CD that is on the FaLife Productions label. I’m about a year behind in getting a new record out, but two years coming October I lost my mother and when you go through stuff like that it’s tough. I wrote all the lyrics on the ‘I Could Show You’ CD and my brother Luster did all the music. On my next CD I would like to write at least half of the songs but I’ve not been in the frame of mind to write, having to deal with my mother. It’s getting to the point where my creative juices are flowing again. I’ve just signed with a booking agency Blue South Entertainment run by Alex Thomas. Going back to my first CD, Harrison Calloway had a strong influence on it, and talking to a person like him is like going to an encyclopaedia. If you have that type of person around you, you should soak everything up like a sponge. I could talk to him for hours and hours and I am interested in who he has played for, what was the experience like. I often think I wish I was older so that I could have been with the likes of Etta James and those people, because to me that music was real. Harrison talks about these people and the other day he was telling me about when he met Jimi Hendrix in his early years. I love to listen to his stories. He texts me most days and I met him through my manager Stephen Hall. He has just passed away but he was also a trumpet player, and Harrison used him on a lot of sessions with Malaco. We just hit it off and been good friends since. Another person I love is Bobby Rush, and I love listening to his stories. I still sing gospel but I’ve not recorded any gospel as yet and that is something I would like to do. Both of my parents are now deceased and they both wanted me and my siblings to do a gospel CD, and we are going to make that happen one day. Teaching is still a full time job for me and I travel with the kids on buses to football games away. I spend a lot of time with students both at school and away from school. I teach fifth grade to twelfth grade, which is from ten years to seventeen years old. I wouldn’t have it any other way. I love my teaching and I love my singing. I’ve been teaching music for twenty seven years at the same school. I have a good rapport with my students and a lot of them now are doctors, lawyers, nurses and they still keep in contact with me. I teach them to play instruments and teach the theory part of it, and teach the history part of music, teach about classical music, teach them vocals, teach the choir. I teach at St Aloysius High School, it’s a Catholic school. I teach the students singing for mass and the marching and concert bands. I play all the instruments because I have to teach the students to play them. Flute, clarinet, trombone, alto sax, baritone sax, drums, trumpet, and I can play all those instruments. As a solo vocalist I mix my music with my teaching. During the season I tend to take the students to football games on a Friday night so I can’t do too much for my career on that night but Saturdays I’m usually gone. My main working areas are Louisiana, Arkansas, Alabama, Texas, Georgia, Mississippi, Tennessee and I’ve been to California, and Chicago. A lot of people ask me how I juggle my teaching and my own career, it’s just that I have a passion and I’m doing it from the heart. I would love to get overseas, as I’ve not done that yet. I currently live in Mississippi. I am a Louisiana girl at heart. Vicksburg is a good place to live and it is quite central for me to travel to my gigs. 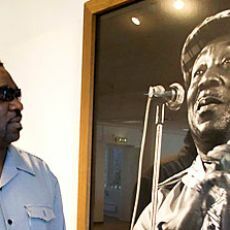 Interview of this soul/ blues singer by Mike Stephenson took place in Vicksburg, Mississippi in May 2013. Many thanks go to Peggy Brown for arranging the interview.